Using the search box that sits in the top right corner of a Finder window defaults to searching everything on a Mac. 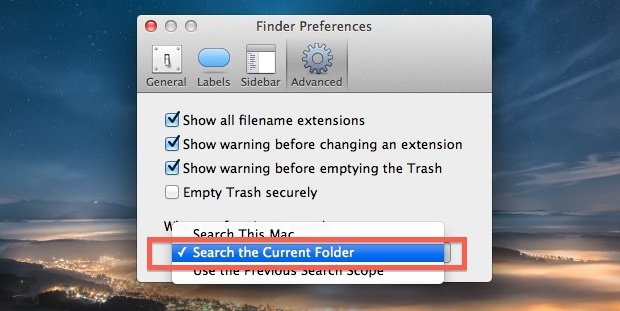 Sure, you can click the center Search option after the fact to narrow it down to the current folder, but often times you’re using that search feature thinking it will look in the current folder first… but it actually searches every single file and folder on the Mac for matches. That’s because it’s tied to the universal Spotlight search feature, but if you use the Spotlight Command+Spacebar shortcut and menubar for the majority of your Mac file system-wide searches, there’s little reason to have the Finder window search set to the same system-wide search setting, and you can easily change it to instead look only inside the current directory, which makes a bit more sense. Now go back to the Finder window search box in any specific directory, and you’ll find the search results will be limited to the current directory rather than everywhere. This setting makes finding things and sorting through the often huge repository folders like ~/Pictures, ~/Documents, and ~/Downloads so much easier, and you won’t end up with results from oddball locations found elsewhere on the Mac filesystem. Switching up the search is so handy we probably should have included it in our recently published list of simple tweaks to greatly improve the Finder of OS X, but it’ll have to wait for our next Finder roundup list. Thanks to CultOfMac for the idea. When did this preference change become available? I love this tip and have changed my prefrences to match. I’ve hated the system wide search for years and haven’t used it in a long time because of it. While you’re at it, do a rundown on how to find generally find files. Example: I want to find a file i know has the word crashplan in it an lies within ~/Library/ or its subfolders. This describes how to search a folder exactly like that. I have been using this option for a while. Using this option still returns files from any subfolders. I wish that there was an option to select ‘this folder only’ or ‘include subfolder’. I quite often want to delete jpeg files from an original photo shoot ( because I keep the RAW files) but it returns the files from the subdirectories as well. Given the choice to only have one folder I could then just press cmd A and know that I was only deleting the files in the top folder. Cool! Can you limit how many levels down it will search like you can with the command line “find” command? i.e. if I want to only search the current folder and not look in subfolders, how would I do that? Unfortunately, this isn’t working for me. When I perform a search in a specific folder, it indicates no results when I know the word exists in an article. Why isn’t search working? I have this problem this problem as well. I’ve had this problem since I purchased my MacBookPro in the summer of 2015. I’ve spent hours on the phone with AppleCare and no one can figure out why finder will not return results with documents that I know contain certain words. I’m afraid Sierra users will discover that Apple always finds a way to make SOMETHING wrong with finding, searching, spotlighting go haywire. This goes back past 30 years, the old complaint: Why doesn’t the Mac Finder FIND things! I’ve done the Finder prefs, searched a specific Library folder. To show how capricious the thing is, it drilled down to find an example file deep down in a subfolder in ‘Application Support’:Display Trailers in Safari.workflow. In another folder in Library at the same level ‘Audio’, it could not find AirPlay. Now look, if I’m missing some syntax or cataloguing or other criteria, do I have to search the internet to find out what it is? I’m not a programmer or IT guy. I use a Mac to make my life simple. Can’t Apple find stuff on its own computers? Are we asking them to put their huge surpluses into boring watches, and self-driving cars that everyone else far more qualified, and their dog, is working on already and is far ahead? Yes! So glad you provided this tip for me to run across. It’s long been irksome to have my Mac require me to ask specifically for search results within a folder, after it returns junky system-wide results. Big thanks!